Definition at line 17 of file StoreIOState.h. Definition at line 30 of file StoreIOState.cc. References flags, NULL, and read. Definition at line 45 of file StoreIOState.cc. References callback_data, cbdataReferenceDone, debugs, and read. Implemented in Rock::IoState, and Fs::Ufs::UFSStoreState. Referenced by Rock::HeaderUpdater::startWriting(), Rock::HeaderUpdater::stopReading(), storeClose(), and Rock::HeaderUpdater::swanSong(). References buf, callback, callback_data, offset_, read_(), size, and write(). 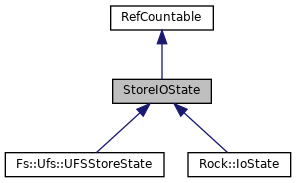 Implemented in Fs::Ufs::UFSStoreState, and Rock::IoState. Referenced by offset(), and storeRead(). References e, swap_filen, and StoreEntry::swap_filen. Referenced by doPages(), offset(), Rock::HeaderUpdater::startWriting(), and storeIOWrite(). Referenced by Rock::IoState::callBack(), StoreIOStateCb::canDial(), Rock::IoState::close(), StoreIOStateCb::dial(), Fs::Ufs::UFSStoreState::doCloseCallback(), offset(), and StoreIOStateCb::StoreIOStateCb(). Referenced by Rock::IoState::callBack(), StoreIOStateCb::canDial(), StoreIOStateCb::dial(), Fs::Ufs::UFSStoreState::doCloseCallback(), offset(), StoreIOStateCb::print(), StoreIOStateCb::StoreIOStateCb(), Rock::IoState::~IoState(), ~StoreIOState(), and StoreIOStateCb::~StoreIOStateCb(). Referenced by Rock::IoState::callReaderBack(), Rock::IoState::finishedWriting(), Rock::IoState::IoState(), Rock::IoState::read_(), touchingStoreEntry(), Rock::IoState::tryWrite(), Fs::Ufs::UFSStoreState::UFSStoreState(), Rock::IoState::writeBufToDisk(), Rock::SwapDir::writeCompleted(), Rock::SwapDir::writeError(), and Rock::IoState::~IoState(). Referenced by storeClose(), and StoreIOState(). Referenced by Rock::IoState::close(), offset(), Rock::IoState::read_(), Fs::Ufs::UFSStoreState::read_(), Fs::Ufs::UFSStoreState::readCompleted(), Rock::IoState::tryWrite(), Fs::Ufs::UFSStoreState::write(), Rock::IoState::writeBufToDisk(), Fs::Ufs::UFSStoreState::writeCompleted(), and Rock::IoState::writeToBuffer(). Referenced by Rock::IoState::callReaderBack(), Rock::IoState::read_(), Fs::Ufs::UFSStoreState::read_(), Fs::Ufs::UFSStoreState::readCompleted(), StoreIOState(), and ~StoreIOState(). Referenced by Fs::Ufs::UFSStoreState::close(), Rock::IoState::close(), Fs::Ufs::UFSStoreState::closeCompleted(), Fs::Ufs::UFSStrategy::create(), Rock::IoState::currentReadableSlice(), Fs::Ufs::UFSStoreState::ioCompletedNotification(), Rock::IoState::read_(), Fs::Ufs::UFSStoreState::read_(), Fs::Ufs::UFSStoreState::readCompleted(), storeSwapInFileNotify(), storeSwapOutStart(), touchingStoreEntry(), Rock::IoState::tryWrite(), Fs::Ufs::UFSStoreState::UFSStoreState(), Fs::Ufs::UFSStoreState::write(), Rock::IoState::writeBufToDisk(), Fs::Ufs::UFSStoreState::writeCompleted(), Rock::SwapDir::writeCompleted(), and Rock::SwapDir::writeError().